This week’s paper is now available from all the usual outlets and online, here. • Northern Isles MP Alistair Carmichael has criticised justice watchdogs over their handling of two reviews into the case of Michael ross, the man jailed for murdering Bangladeshi waiter Shamsuddin Mahmood at a Kirkwall restaurant in 1994. • Orkney retains the title of best place to raise kids. • Scottish Government plans could threaten local NHS services in the northern Isles, according to MSPs Liam McArthur and Tavish Scott. • A Stenness man who was a custodian at Maeshowe for almost five decades has hit out at plans to close the ancient monument later this month. • The son of an RAF serviceman who was based at a radar station in the Orkney West Mainland makes an emotional journey back to the isles, following in the footsteps of his father. For all these stories, plus round ups of all the week’s top stories. 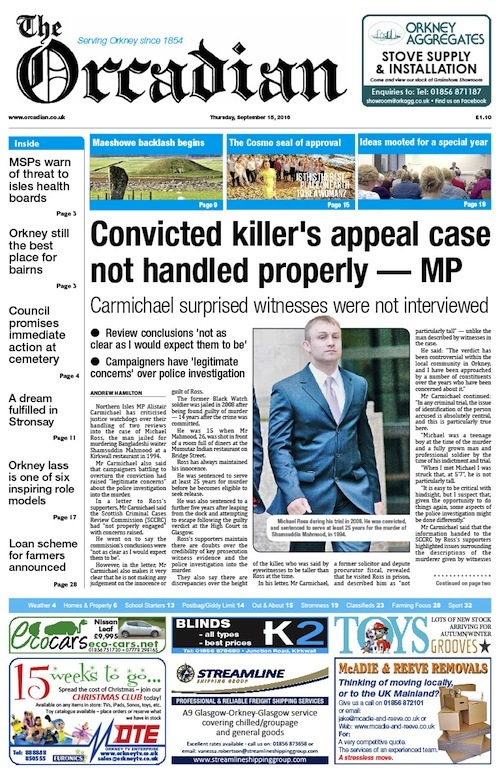 Pick up a copy of The Orcadian today. Next Post>Your bowel test could be a lifesaver!